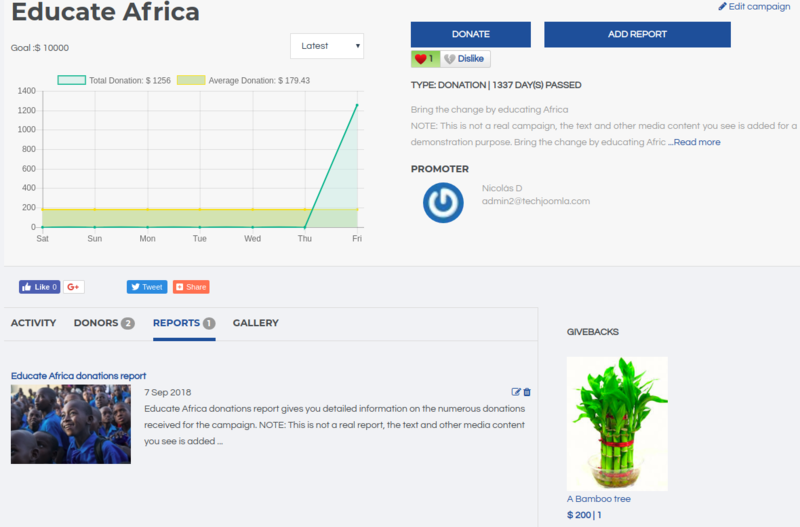 JGive is a powerful “crowdfunding” extension that enables your members to create fund-raising projects; accept donations or Investments, and keep donors updated on the project’s progress. 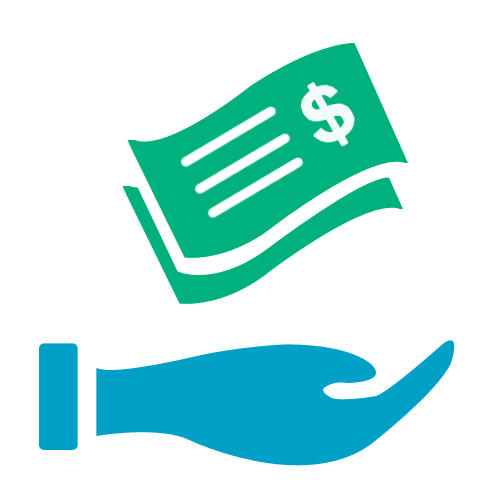 Whether your members need to raise money for personal projects, causes, charities, business ventures, medical bills, musical endeavours, school events or non-profit fundraisers, our JGive extension makes it possible to do it with ease. 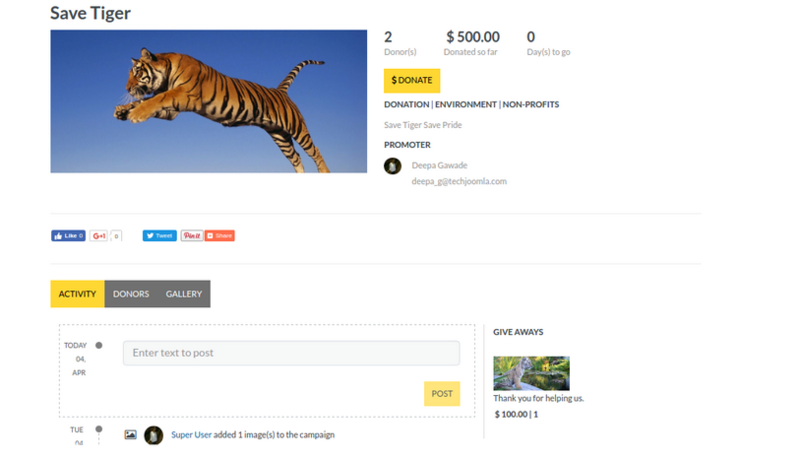 What's more, if you have a Social Networking extension like JomSocial/Community Builder or EasySocial, they can even transform their profile page into a mini-fundraising site - just like microgiving.com. No matter what kind of community or site you host, JGive is an app that your members will absolutely love and use in different ways. If you host a musician’s community, for example, your members could seek donations from fans to help fund the recording of their next CD. An entrepreneur could seek start-up capital from investors to build their latest invention. An open source software developer could seek donations to support the development of his free software. A boy scout’s troop could seek donations for a fundraising project. A blogger could request donations to help him/her pay his/her hosting fees. The possibilities are endless. JGive is built using the Joomla MVC Framework which means you can easily extend & override what you want. Plus we have a very strong plugin API with lots of triggers allowing you to easily extend & integrate JGive as per your needs. Note-Please note that the JW Player for JGive is a paid subscription and not shipped along with the JGive subscription. The JW Player subscription needs to be bought from the JW Player website. JGive is fully Bootstrap 3 compatible. 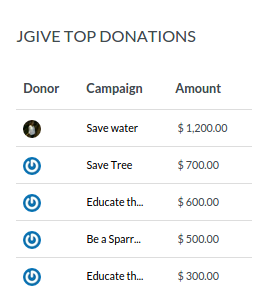 JGive has the ability to allow recurring donations. At moment this functionality is available only with the Paypal payment gateway. We will extend it to other Payment gateways depending on demand in later versions. 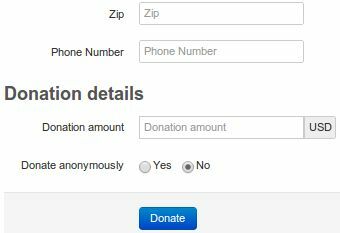 JGive also lets you add donations manually from the backend for those donors who walk into the office and pay donations offline. 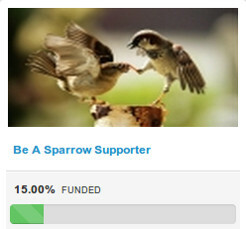 Donors will get a donation confirmation receipt in email after successful donation. 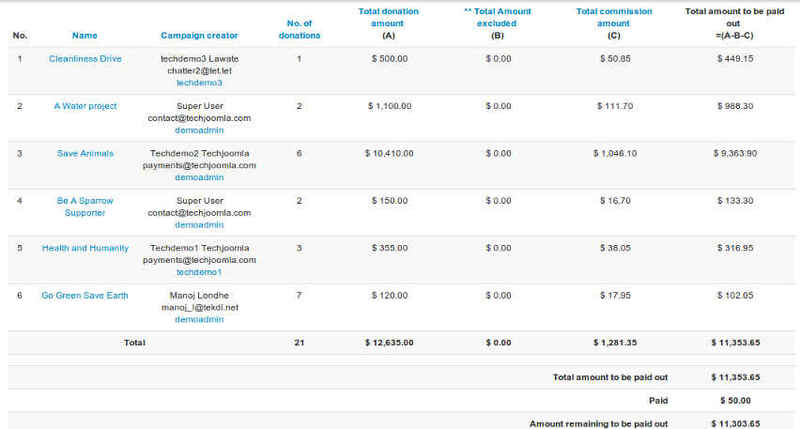 Admin has an access to the list of donors and their details for the various campaigns through the Donors List View. 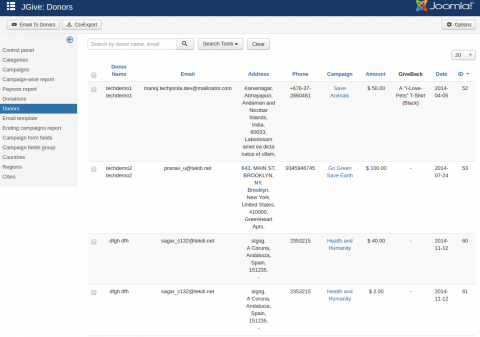 The Search tool allows the admin to filter the Donor list by various fields like Donor name and email id. 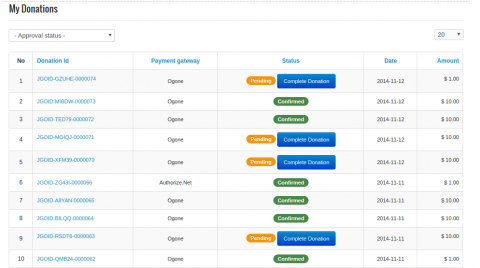 JGive will support centralised vendor management and payouts via TJ Vendor. With JGive 2.2.0, we have introduced support for money library to support currencies in a more meaningful manner. 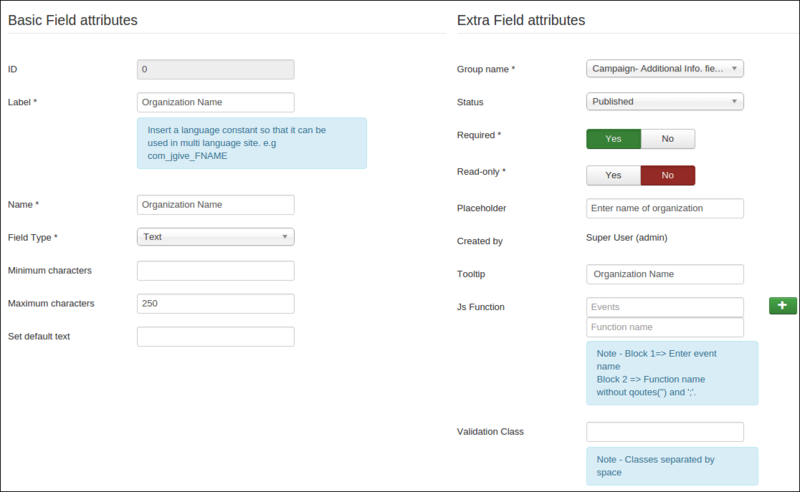 Campaign wise module enables the Campaign owners to highlight the single campaign on any part of the website after selecting the module position. 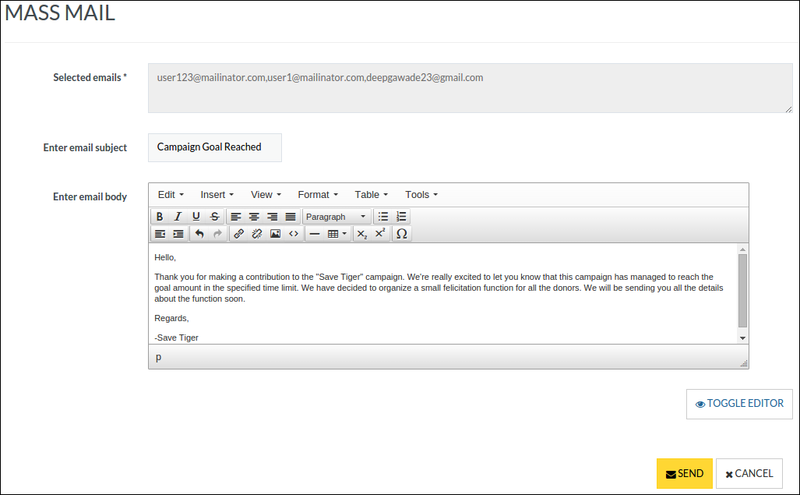 With JGive 2.2.1, we have provided more flexibility to display all the campaigns from a specific category. Actionlog plugin for JGive allows site administrators to log actions for various activities related to JGive like campaigns, donation/investment for their site users. This plugin adds support to the action logging system introduced by Joomla in Joomla 3.9. 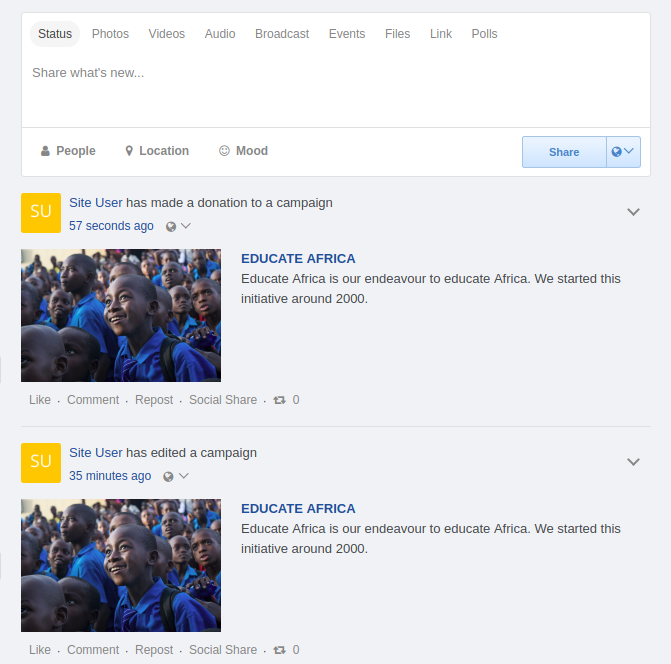 Users can create multiple fundraising projects or campaigns. Besides other details to educate visitors about their project, they can also set fundraising goals ($50, $500, $5000, etc). Time left for the campaign, no of donors who have donated toward the campaign, amount donated so far are shown on the campaign pages. 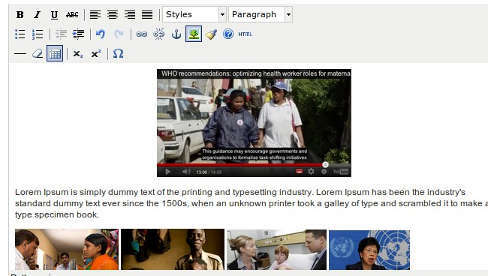 Users can use a full featured Rich text editor to add descriptions about their campaigns. We recommend using JCE and setting up a Profile for frontend submissions that allow only the required features on the frontend. This means you can now add multiple Photos, Videos etc to your campaign! The Campaign owner can schedule a start date and end date for his campaign and schedule them in advance if needed. Advanced options like "Allowing Donations to Exceed Goal Amount" and deciding if donations should be shown publicly or not are available. Impress your donors/investors by maintaining an awesome campaign gallery! You can add multiple images to the campaign and show them in a nice gallery layout with lightbox effects. In case of videos, with this feature, you can show the donors/investors that the funds they will be sending or have already sent will be used in such a way. Creating campaign specific videos is going to help you build that trust and eventually get more donors/investors. 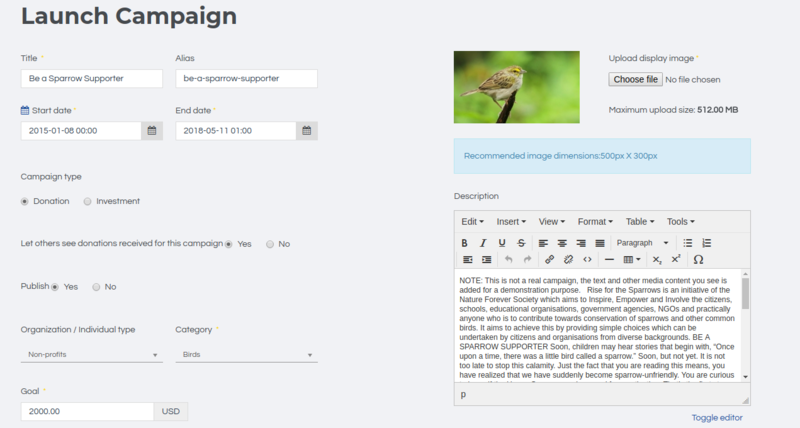 You can now make your campaign look impressive by adding a primary campaign image or campaign video to the campaign. - for a $100 donation, “Bob” will send each donor a signed thank you card. - for a $200 donation, Bob will personally call them to thank them, etc. Giveaways or Rewards have a prominent display and can have an image associated with them. 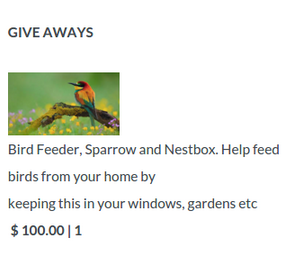 In addition, donors can specifically choose the give away they want. Show Your Donors Some Love ! 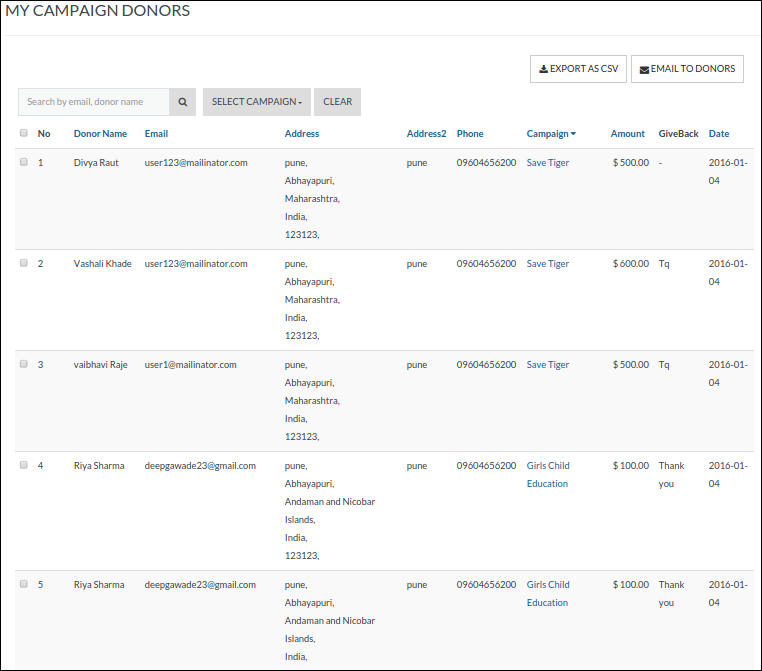 jGive lets you show your campaign donors in a nice tab on your Campaign page. It's a great way to say thank you ! Donor Name, Donation amount and Donor Avatars from CB/JomSocial or EasySocial will be shown if you have one of these extensions. 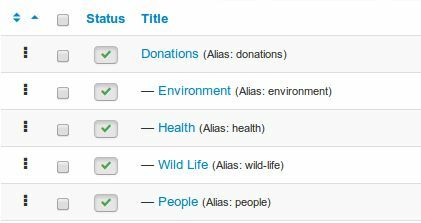 Donors also have an option to not be listed publicly in which case, they will show as anonymous donors on this view. Beautiful and Responsive With Bootstrap 3! 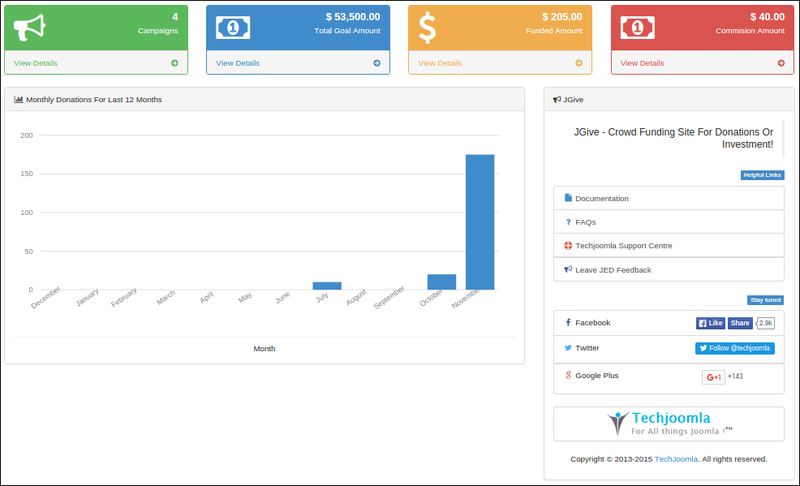 JGive uses Bootstrap 3 to give an awesome and modern look at all its views. Plus all major views are also responsive which means if you are using Joomla 3.x or a responsive template you will be ready for Mobile too! Now you see all the campaigns in a fresh new layout inspired by Kickstarter. It comes with a great horizontal layout for filtering the campaign and an independent sorting dropdown option to help your users find the campaigns they want. Its now easier than ever to find the campaign of your choice. Streamlined Checkout Process With Guest Donations, Silent Registration and More! jGive has an awesome streamlined checkout process that ensures maximum conversions. Donors have an option to Login or do a Guest checkout or Register silently without having to fill any extra fields. We regularly improve the checkout processes in all our e-commerce extensions to ensure maximum conversion. Donor data is pretty important for non profits. Our streamlined checkout process has an efficient way to capture donor data. 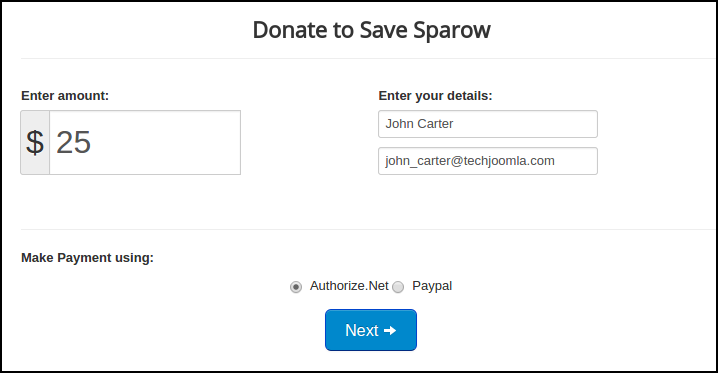 Returning donors or donors having profiles on your site do not have to re enter data with our Autofill feature. You can use this super versatile module to feature your campaigns on other pages of your site. on any page you want in a slick display. The best use of the module is to make copies of it and set them on different modes to make the Home page of your Funding section. Using this module, you can show various types of JGive data on any page you want ! Why increase the time of donation / investment process with long never ending form filling session and thus reducing the donation / investment rate? 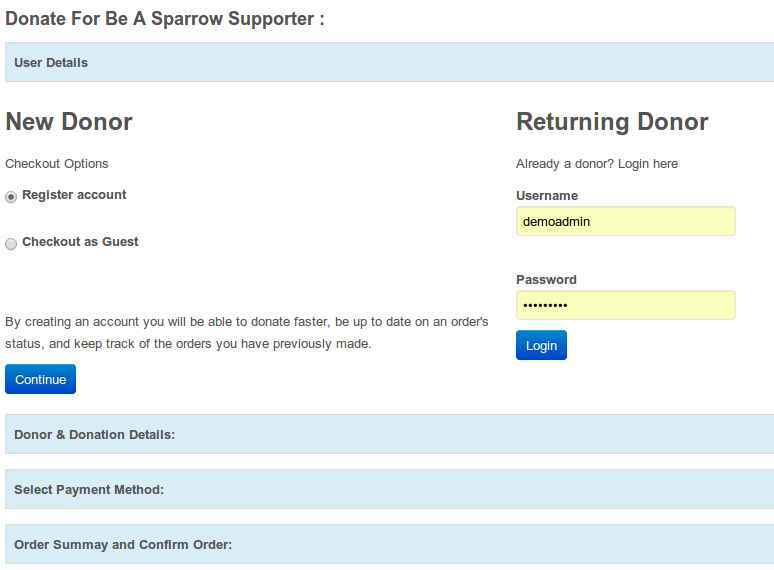 With Quick donation feature the donor / investor have to just fill his name, email id, select the payment method and Done! With this feature you can show the donors / investors that the funds they will be sending or have already sent will be used in such a way. Creating campaign specific videos is going to help you build that trust and eventually get more donations / investors. Campaign owners can closely monitor their campaigns by having a look at the graph that shows that 'total donation' and 'average donation' of his campaigns. One can also look at the top 4 donors for the campaigns along with the recent 4 activities associated with the campaigns. The campaign owner can also have a look at the campaigns created by him in 'My campaigns'. Select your campaign and have a look of donors for that campaign at a glance with new this new donors list view. You can also select the donors from this view for mass mailing. Complete your pending donation with the Complete donation option if you are not able to complete your donation due to technical issues. Extensive field based filtering for Campaigns with 'TJ-Fields' based filtering for all the item display pages. The brand new activity stream system creates an aggregated stream of all activities happening around the campaign. Stay updated with your campaign! Campaign owner can create and delete reports from the frontend. Reports inform the donors about the campaign's progress and also provide information on what the promoter is doing with the money received from donors. 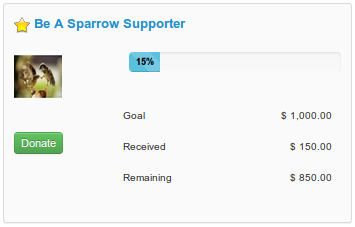 Category wise progress module displays the total amount raised and the goal amount for the selected categories via the progress bar. 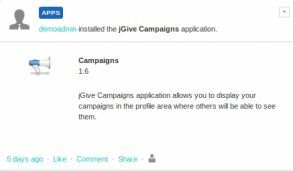 jGive Integrates with EasySocial, JomSocial, Community Builder and JomWall for User Data, Avatars and Activity Stream data push. - You can opt to use user data, avatar and activity stream integration -from any of these extensions. - You can also map data fields to be automatically pulled from Joomla, CB, JomSocial or EasySocial. - You can also choose to integrate with plain Joomla if you don't have or need these integrations. The Easy Social Integration integrates pushes for all jGive activities into the EasySocial Stream. 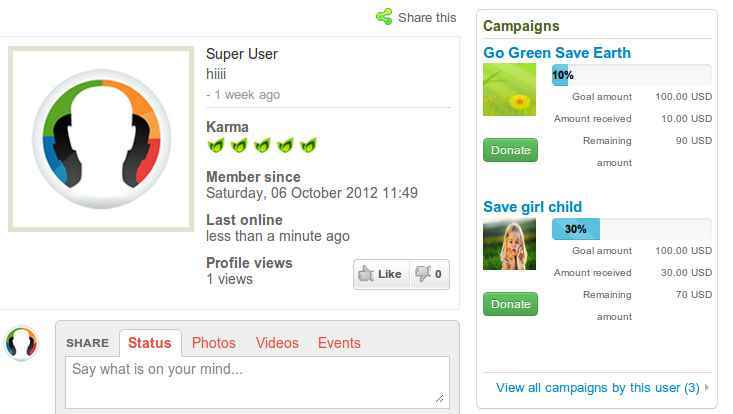 Plus campaigns owned by the user are shown on the User's Profile using the My Campaigns Application. Shows the campaigns owned by the user on his profile in a nice and compact manner. Let users accept Donations from their profiles! 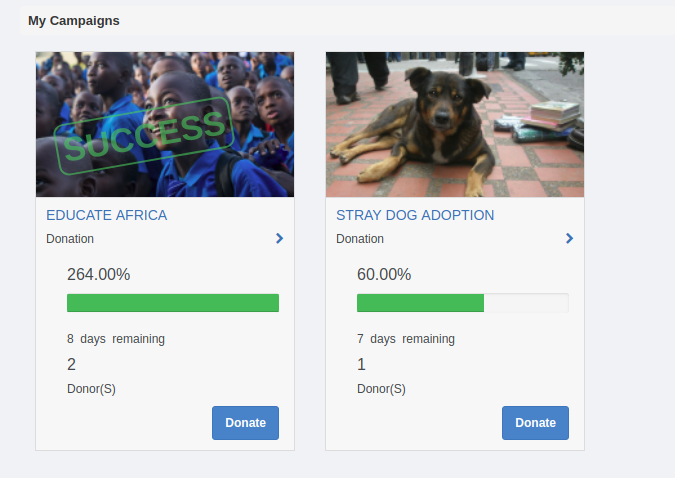 The plugin shows a quick snapshot of the user's campaigns on his or her profile with a nice progress bar as well as a quick and easy donate button. Number of campaigns to show can be configured by the admin. You can tie-in your campaign with your JomSocial groups and also show it on the Group pages using Campaigns module. Now you can start doing Group specific campaigns or investments! You can enable native social-sharing for Twitter, Facebook, Google+ along with support for Open Graph Tags. Or you can also switch on AddThis based sharing. Adding one more community integration in JGive’s kitty along with JomSocial, EasySocial, CB and JomWall. EasyProfile is yet another awesome social networking extension if you’re looking for something very light and simple. JGive now tightly integrates with this one. Quickly and easily customize your email templates with TJ notifications. JGive's activity stream format is now aligned with EasySocial and JomSocial activity stream. 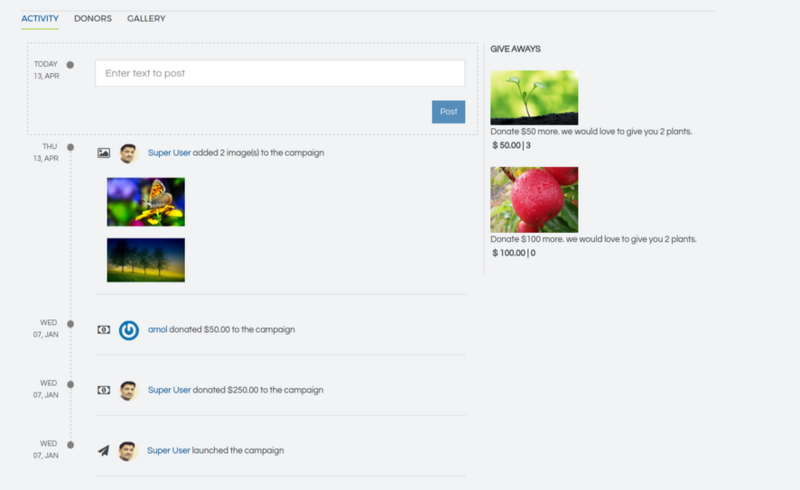 From JGive 2.2.0, campaign image and description is displayed along with the campaign link for the newsfeed notifications. Admins can get a bird's-eye view of the campaigns running on their site using this report. It shows a consolidated view of total donations received for the campaign and commissions for it. View showing all the donations happening on the site with Campaign filter. We give an easy to use Payouts manager where the admin can see pending payouts and document them easily. Actual payments from the site to campaign owners need to be handled offline unless you have approval for Paypal Mass payments. Offers a quick and easy way to see the list of campaigns the user is running on the website with a snapshot of performance. Make it easy for Donors to see all their donations in one place with the My Donations view. Show the Campaign owner a history of his payouts and details of how much the site owes them. Campaigns Report displays the list of campaigns along with their start dates, end dates, number of donors, goal amount and donations received for the campaign. 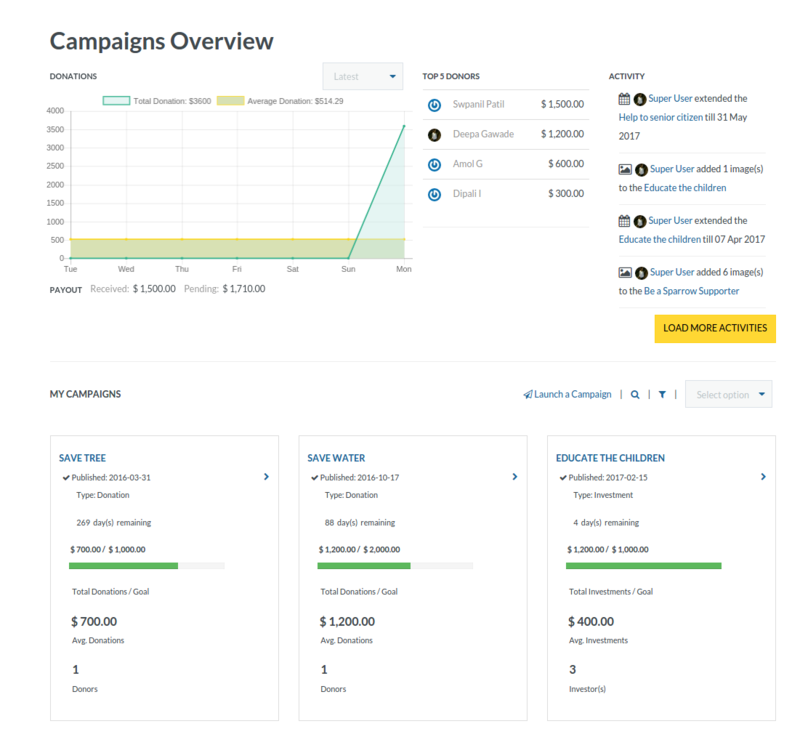 Campaigns Promoter report is vital for campaign promoters as it provides information regarding the total number of campaigns and total amount raised against the campaigns. This report displays the donor details like first name, last name, address, phone number, the amount paid along with giveback if it is applicable with respect to the campaigns. The focus is here on individual campaigns with respect to the donors. Donors report gives information on the number of donations and total amount donated by the donors.